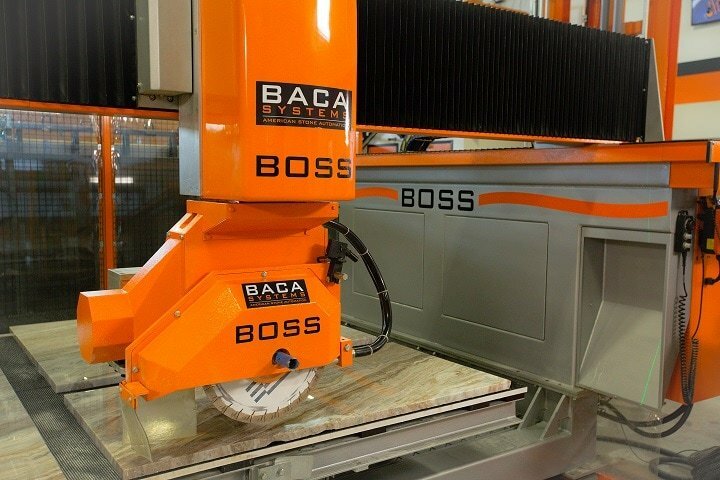 BACA Boss Saw is designed to be the foundation of your sawing operation, providing capability to perform a full complement of cuts to allow sinks, arcs, and faucet holes to be processed during the sawing operation. Fabricators that move up from a manual saw to a BACA Boss can instantly reduce sawing time and increase profitability. BOSS Saw is constructed of a heavy welded steel mono-block frame, allowing installation to be completed quickly. The rigid frame construction is designed to provide a large working area while utilizing floorspace efficiently. All structural members are stress relived for maximum stability, and all mounting surfaces are precision ground and/or machined. The major axes of the BOSS are driven by rotating nut ball screws. This design provides a fast and reliable drive systems that has a stiff, zero backlash construction. The bridge and carriage traverse on precision ground, profiled linear rails supported by sealed ball bearing blocks to provide high accuracy motion and rigidity during cutting. The BOSS features a large work area measuring 78" x 138" to allow cutting of large granite and quartz slabs. The cutting table is capable of tilting upward to angle of 85 degrees, making it easy for an operator to load slabs onto the saw. The surface of the table is covered with rubber to help keep material in position during the cutting process. The BOSS Saw was designed for maximum flexibility, with the capability to perform conventional saw cuts as well as miter cuts. The systems can also utilize core bits and finger bits, allowing more work to be completed in the sawing operation. The BOSS Saw system can utilize CAD drawings to perform automated cutting and can also be moved manually. This allows the operator to perform free form cuts as needed, by utilizing the laser to line up the cut on the stone. BOSS can be supplied with a vacuum lift unit capable of moving pieces up to 440 lbs. This allows slab yield to be optimized by moving a piece in areas where a cut would damage an adjacent piece. A vacuum pump provides the lifting power to hold the cut pieces during movement. The cutting table includes a large working area measuring 78” x 138” to allow cutting of large granite slabs and quartz. The cutting table is capable of tilting upward to angle of 85 degrees, making it easy for an operator to load slabs onto the saw. The surface of the table is covered with rubber to help keep material in position during the cutting process. The saw motor includes the ability to cut with a ½” GAS bit, allowing arcs and sink openings to be processed. A core bit can be used to allow faucet holes to be easily cut in the sawing station. A 1” diameter water line supplies cooling water to improve cutter life and provide faster cut speeds. Includes a blade measurement sensor for automatic compensation of the cut position as the blade wears. This eliminates the need for the operator to manually adjust machine parameters to correct for blade wear.